55+ Dog Essentials - The Ultimate Guide to Getting a Dog! 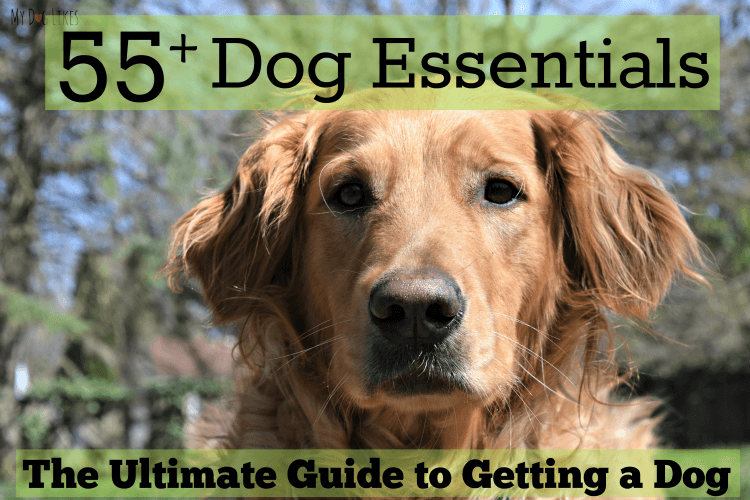 55+ Dog Essentials – The Ultimate Guide to Getting a Dog! So, you’re getting a dog! Congratulations, how exciting! Whether you are a first time dog parent putting together a puppy checklist or a seasoned veteran in dog ownership, this resource guide will be helpful as you create your list (and check it twice) with all the necessities, lifesavers, and good to have’s that make owning and loving a dog such a fun and rewarding experience. If it all seems a bit overwhelming, relax! By no means do you need everything on this list right away. Instead, we wanted to put together a comprehensive resource for dog owners to learn about what dog supplies are out there. For your convenience we have also linked to many of our reviews throughout the post in case you want to learn more. We are also going to help you score some exclusive deals so keep your eyes out for special discounts for our readers! So go ahead and scroll to get started – Or if you prefer, use the buttons below for easy browsing! One of the most important decisions you will need to make is what to feed your new best friend. There are a lot of dog food options on the market in a variety of forms – standard kibble, grain free kibble, raw, freeze dried raw, and even items designed to help you to prepare your own dog food! You will want to speak with your vet, do some research and decide what best fits into your lifestyle and budget. We think choosing the right food makes all the difference and know that good health starts in the kitchen! Want to make things easier? 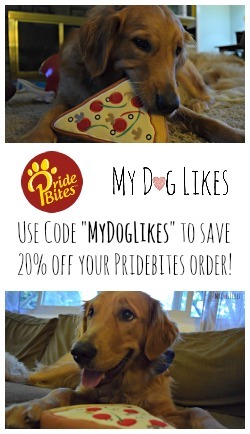 Try out a premium dog food delivery service! Your new puppy needs something to eat and drink out of! You will want to choose a stainless steel or ceramic bowl that is easy to clean and will not hold on to bacteria or corrode. 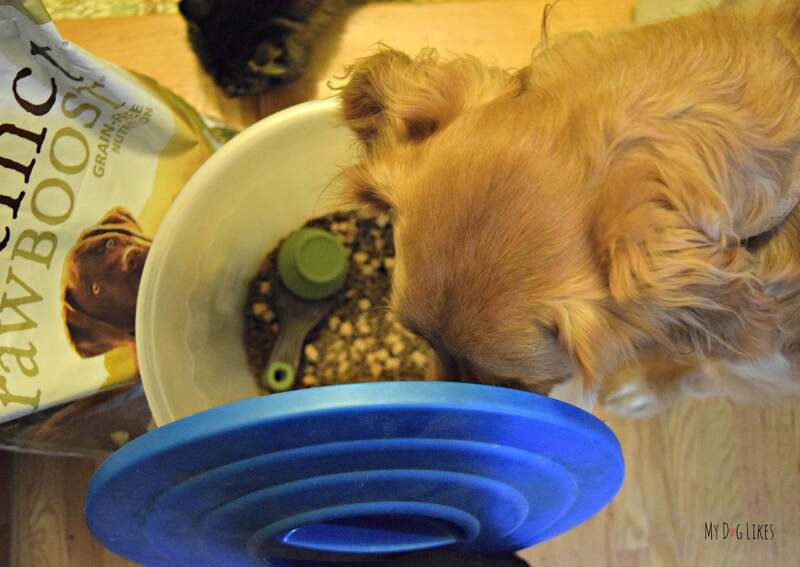 We love our Double Feeder from Messy Mutts (pictured above) because the bowls sit in an easy to clean non-slip silicone mat. It even has a raised edge to contain spills! If you have never had a dog before, you may not understand the significance of this, but they are not always neat and tidy when eating and drinking. No list of dog necessities would be complete without mentioning collars! 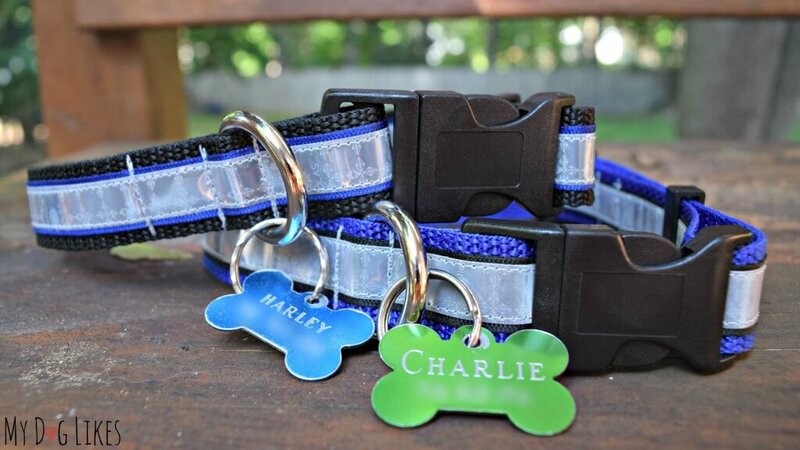 When it comes to dog collars you can have your pick of colors and styles. Remember that your dog will likely be wearing this day in and day out for years so durability is a major concern. It is also important to keep in mind the type of activities your dog will be participating in. For example, their are waterproof dog collars for swimming, reflective collars for walking at night, and even tracking collars for safety and security! 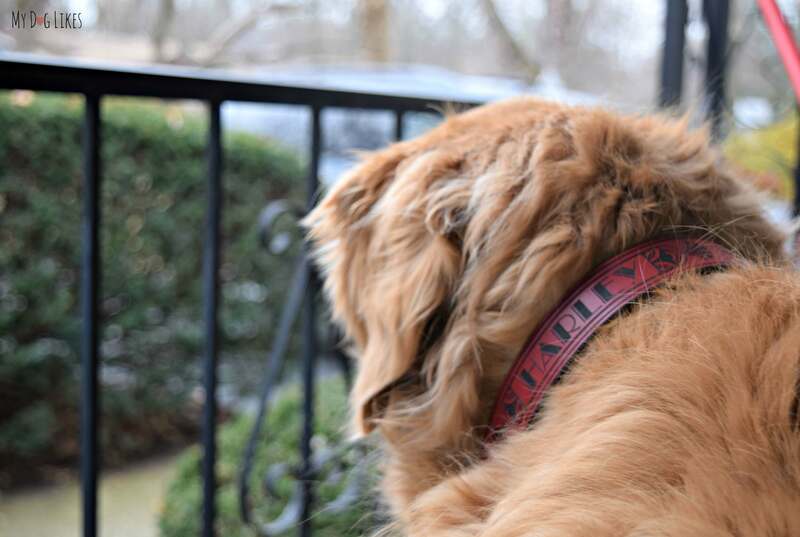 We have reviewed plenty of dog collars over the years but our absolute favorite is the RUHA Leather Dog Collar that Harley is wearing in the photo above. He has been wearing this daily for a year and a half and it still looks as good as the day we got it. It has withstood plenty of wear and tear as well as conditions such as water, snow, and mud. RUHA collars can also be laser engraved with your dogs name and even your phone number! That means no more jingle from dog tags! Make sure to choose a collar that is the appropriate size for your dog (you should be able to fit 1-2 of your fingers between the collar and their skin when secured). While no one wants to think about the worst case scenario, a collar with appropriate identification is one of the easiest ways to reunite you and your dog should you ever be separated. Regularly walking your dog is important not only for the physical exercise but for the mental stimulation it provides. Daily exploring and adventures can also go a long way in forming a bond with your companion. Remember that that walk around the block can be their only glimpse into the outside world on a given day! Don’t rush – enjoy your time together! Let them smell the smells and explore their environment. 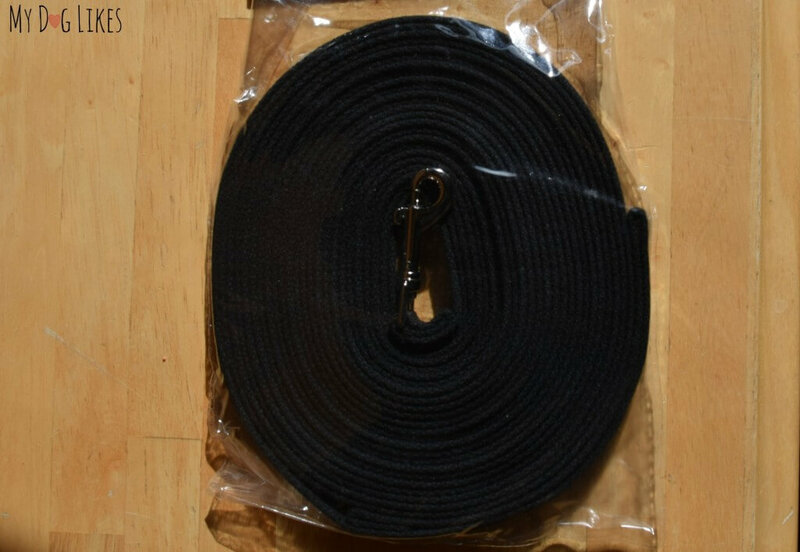 You will want to pick up a leash that is sturdy yet comfortable in your hand. Their are plenty of options available including nylon, paracord, and even leather. Though retractable leashes are popular, we do not recommend them. Retractable leashes can make it difficult to control your dog and cause injuries to the people that use them. Easily one of the most important items on this list. Identification tags with a contact phone number could save your dogs life and make sure they are returned to you in an emergency. They are available at any pet store and can be engraved in a matter of minutes. Pair these with microchipping from your vet/a microchipping clinic and your dog can be identified even if a tag is lost or removed. 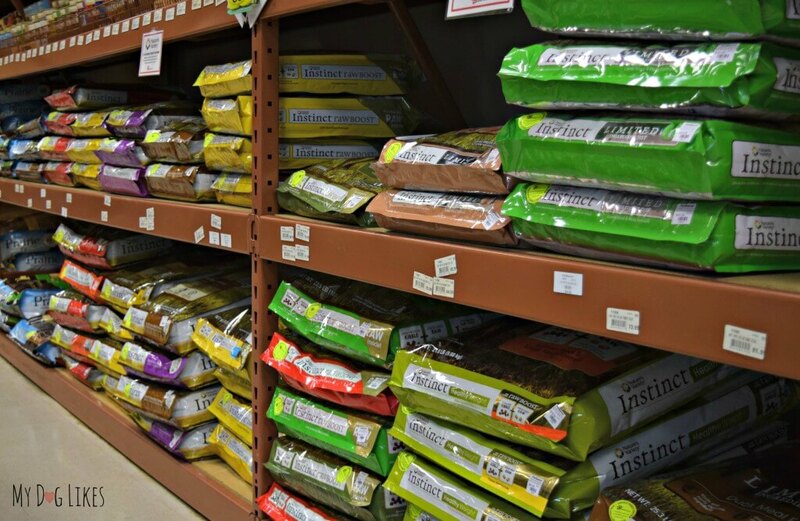 A large storage container will help keep your dog’s food fresh after you open the bag. We suggest something with a sealing and locking lid. Not only will this keep out air, but any curious paws (or creepy crawly friends) as well! We love air tight containers for treats once they have been opened as well. Treats will retain their smell and last longer when stored properly! Regulating your dog’s weight is extremely important, and proper calorie management is essential to this cause. A measuring scoop or small kitchen scale will help assure that you are supplying the proper portions. We love our collapsible measuring scoop from Dexas because it is so easy to travel with. It even has a built in clip to keep your food bag closed! 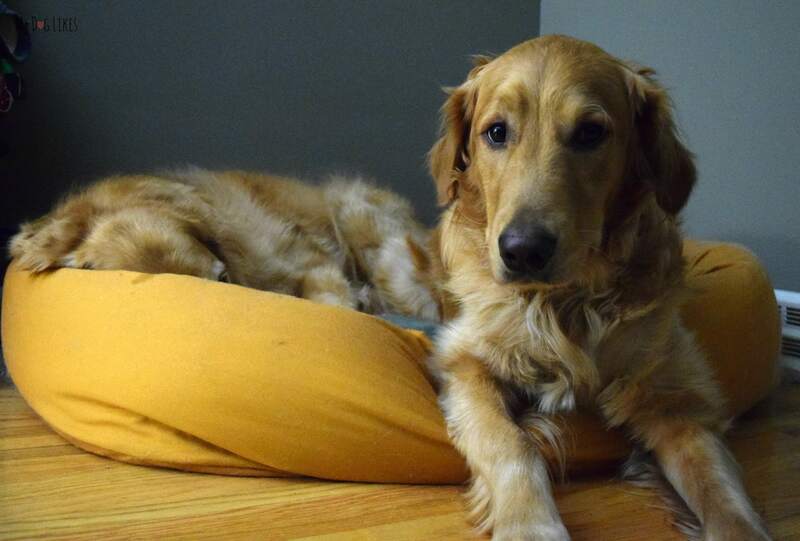 Unless you want to be sharing your bed with your furry friend, a dog bed is a must. There are several popular styles including corner, bumper and nest. We purchased the West Paw Design Bumper Bed for Harley several years ago and couldn’t be happier. It is HUGE, soft, and durable. Best of all – washing it and keeping that dog smell at bay is a breeze! Next up, we have our eyes on this ZenDen bed for little Charlie! Depending on your dogs behavior on the leash, a harness is an excellent option if you need a bit more control. For dogs who love to pull, we love the PetSafe Easy Walk Harness. This harness works by redirecting your dog and connects in the front to provide tons of control. Not sure what you need? There are several different styles available with leash attachments on the back or the front. If you have a SERIOUS puller, a standard harness may not be the right choice, read below for our favorite no-pull harness! Hands down the best solution for a pulling dog! Let me say this and get it out of the way. 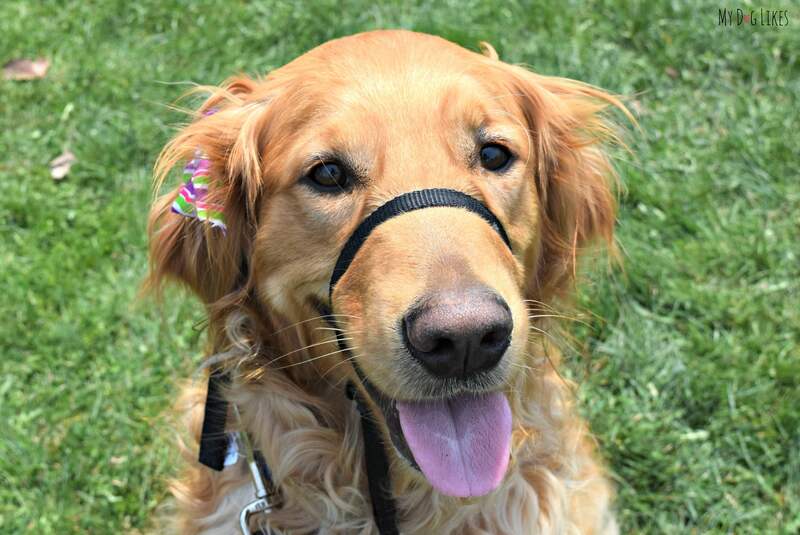 Your dog does not need a prong or choke collar! I repeat, your dog does NOT need a prong or choke collar. The gentle leader is a harness that attaches over the snout and behind the head. It is designed in such a way that when the dog pulls, their head moves backward toward you as opposed to their body surging ahead. This is how animals which are massively powerful (think horses) are controlled and led by humans. The gentle leader completely solves the pulling issue for many dogs as they realize that that behavior does not yield the result they are looking for. We started using this for Charlie as an exuberant young pup and it did wonders on his leash skills! He no longer requires it for daily walks but it is still great to have on hand when we are taking him through crowded areas. Whether you are working on a new trick or standard obedience, you will need treats to reinforce good behavior. A waist mountable dog treat pouch makes it easy to dispense those necessary treats without the hassle of digging through a bag. We love our treat pouch from PetSafe that has a built in hinge design so it stays open or closed with just a quick flick. Positive training creates behaviors that last. 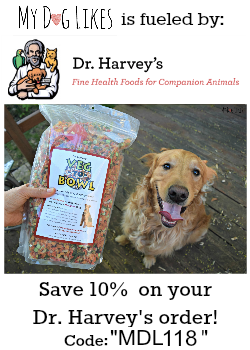 If you are interested in having the dog you always dreamed about, investing in a treat pouch and rewarding your dog for the right behaviors is the single most effective way to do so while strengthening your bond. You know they are going to do it – so be prepared when they do! There are many reasons to pick up after your dog, most important of which is preventing the spread of disease. We highly recommend choosing biodegradable poop bags to cut down on environmental waste. Poop bags are made of a very thin plastic and come on long rolls. Unfortunately, they can be difficult to separate – especially in cold temperatures! For easy dispensing a poop bag holder is key. 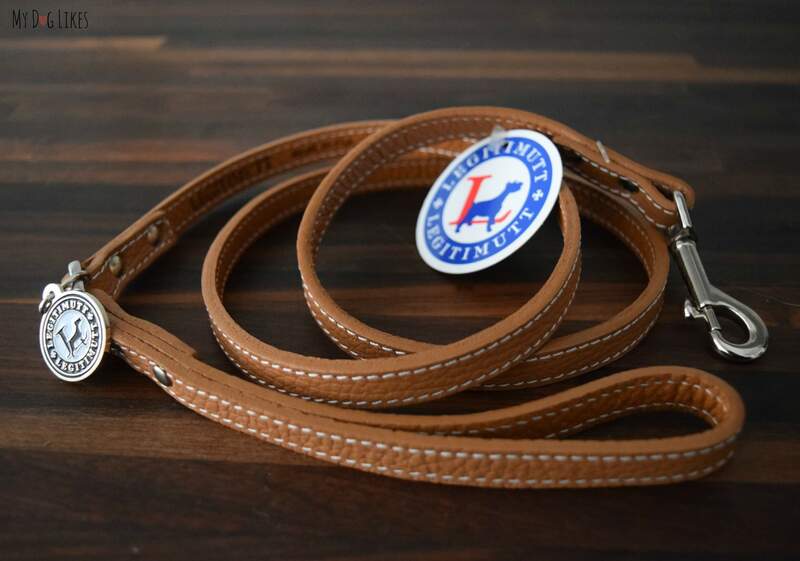 They come in a variety of different styles but we recommend one that attaches right to your dogs leash. This way they are always there when you need them! It seems to be a law of nature that a dog will wait until they are at the furthest point from home to do their business on a walk. 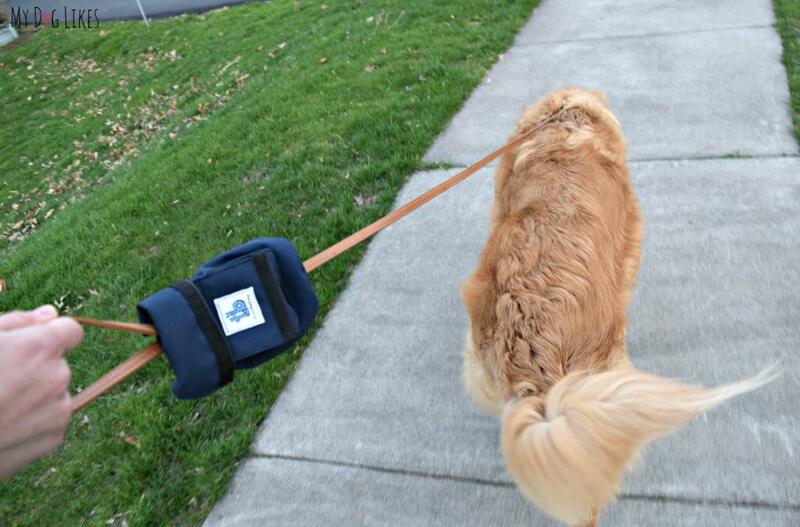 Solving the problem of managing your dog AND carrying a poop bag, The Fifth Paw is a hands free leash attachment that allows you to clip in your dog’s waste. No longer is that disgusting bag swinging in your hand for the next mile, but is instead hanging unobtrusively from your dog’s leash! The Fifth Paw is designed to attach to any standard dog leash and weighs only a few ounces. 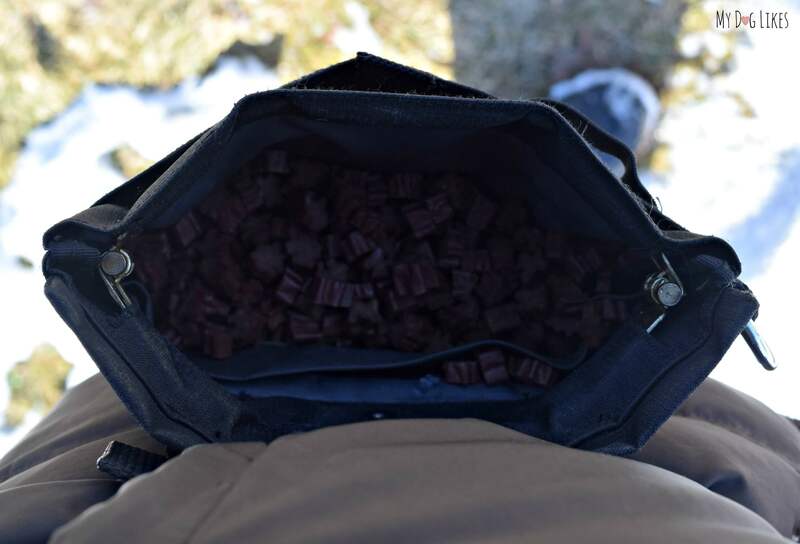 Another great option is the Turdlebag which not only holds used bags of poop (while keeping odors contained) but even has a built in bag dispenser. If your dog will be doing their business in your yard you will likely want to purchase a designated “pooper scooper” to keep the yard clear of “land mines!” No one likes to step in a smelly surprise and the yard should be usable space for the entire family! Your dog’s paws are not as tough as you may think, and extreme temperatures on both ends of the spectrum can be harmful. In the Summer months, pavement can reach temperatures in excess of 140°F! A good rule of thumb is that if it is too hot for the back of your hand, it is too hot for your dogs bare pads. The winter months can bring additional dangers such as road salt and chemical ice melts. These items can be corrosive to your dogs paws and pose a further danger if they lick their feet post walk! Another common issue is the buildup of ice and snow between the pads. Not only is this uncomfortable but it can also cause irritation and bleeding. 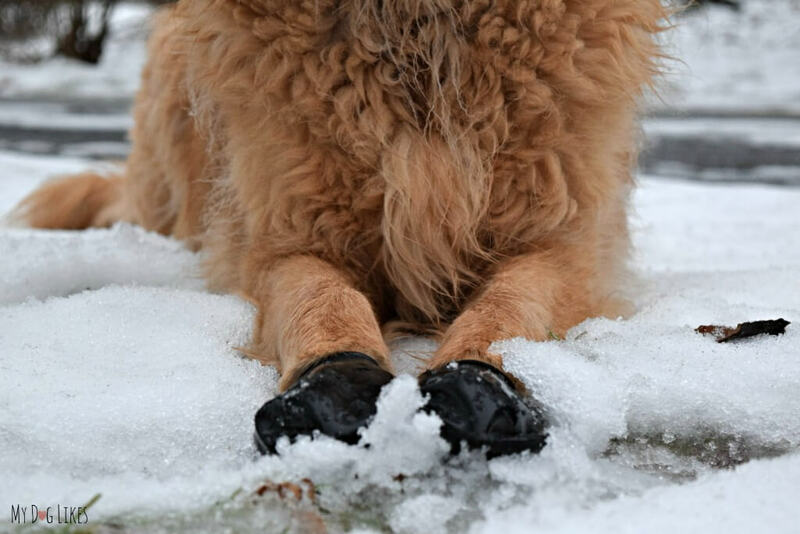 Dog boots are a simple way to protect your dogs paws from the elements. Our favorite are Pawz (shown above) and unlike other more clunky boots, Pawz are like small rubber balloons that fit over your dog’s paws. Since your dog can still feel the ground beneath them they often tolerate them extremely well. You can read our full Pawz Dog Boot review here! 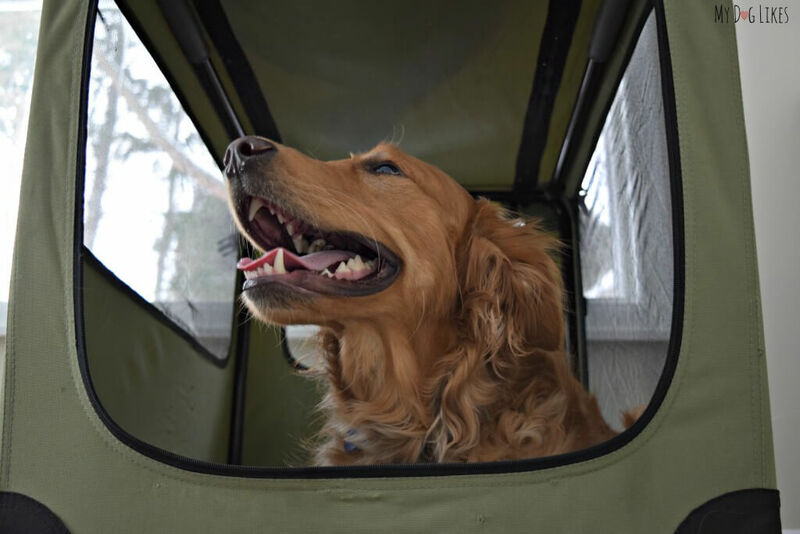 Most dogs love car rides, and it is always fun to go on an adventure together. Unfortunately, they tend to leave quite a bit of themselves behind afterwards! A seat cover is a great investment to protect your vehicle from hair, muddy paws and whatever else your pal gets into! We have a car seat cover as well as an SUV cargo liner from 4Knines and couldn’t recommend them more. They are beautiful, durable, washable and install in seconds! Have kids? 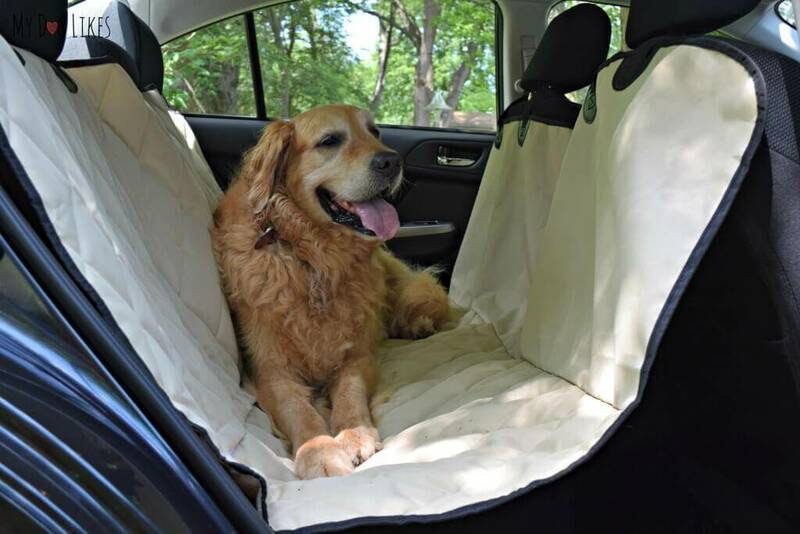 these seat protectors can be used with a car seat, doing double duty to keep your ride in tip-top shape. An extended leash will come in handy for training, but also for travel. Whether you are practicing “off leash” commands or perhaps your dog is like Harley and refuses to poop on a 6-ft leash, a long lead can be invaluable! Note: We do not recommend retractable leashes for a number of reasons. For starters, when used with a large or fast dog they can quite easily snap! This is a situation we have experienced multiple times in the past! Secondly, since dogs can gain significant momentum on a loose retractable leash there have been many instances of injuries to dogs neck, trachea and spine due to the sudden jerk. Thirdly, the thin cord can cause a serious rope burn to anyone it comes in contact with – Just ask Rachael!!! Depending on where you are traveling, a crate is often necessary to bring along. Not only can it keep your dog safe, but it also helps them to feel safe in an unfamiliar environment. Ideally you will want something lightweight and easy to assemble. We recommend the Noz-to-Noz soft crate. Not only is it lightweight, but is sets up in just a few seconds and looks great. 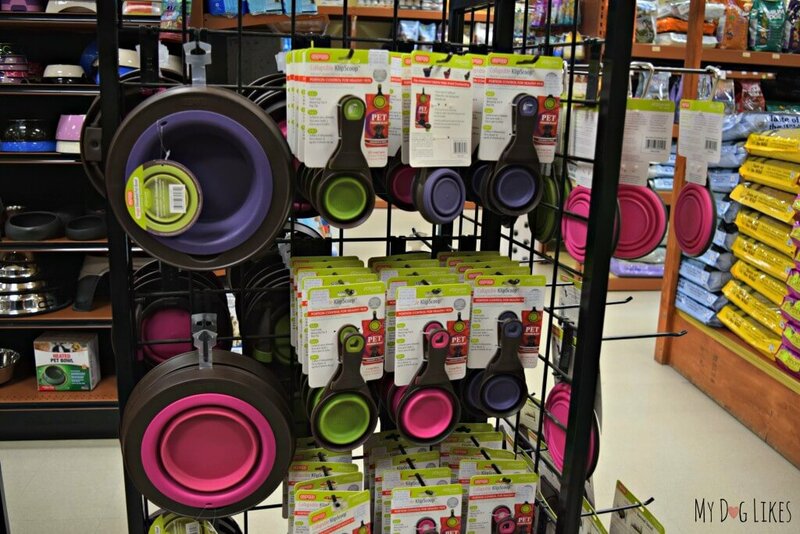 Perfect for hiking and travel, these bowls are typically made of a canvas or rubber material that can be collapsed down flat. 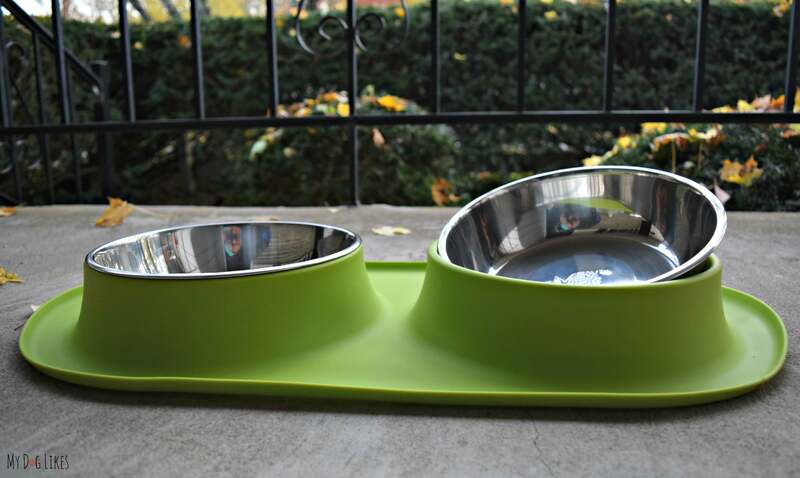 Keeping your dog well hydrated is so important when traveling or doing physical activity and these bowls make it super easy to remember to hydrate. Perfect for when space is of a premium in a backpack or suitcase! These sprays can be used as an alternative or in conjunction with a topical monthly treatment. 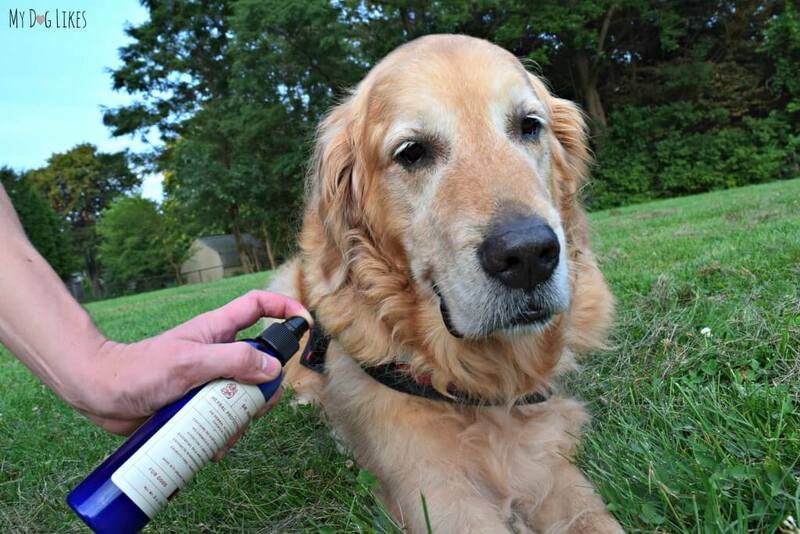 Unlike harsh chemical products which work to kill pests after biting your pet, these sprays work to repel bugs before they bite (so important if your dog has a flea allergy)! 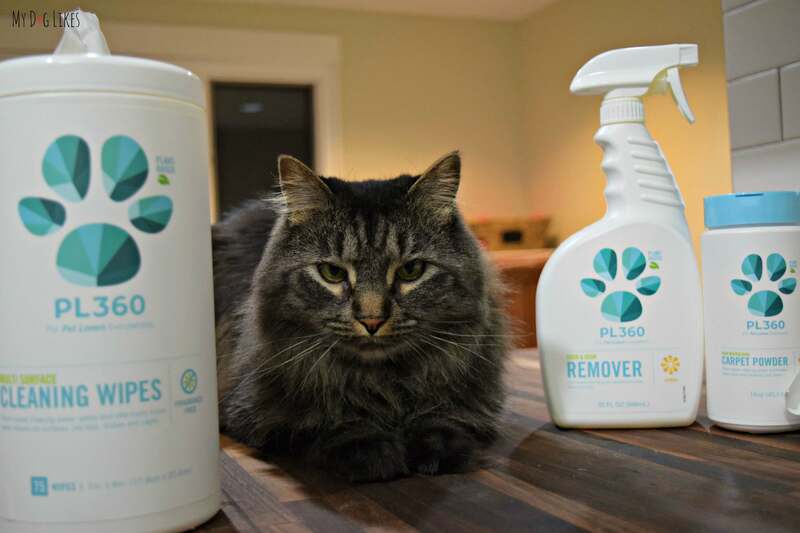 We are big fan’s of Dr. Harvey’s Herbal Protection Spray which uses natural insect repellents like Catnip Oil, Citronella Oil, and Cedarwood Oil. These oils have been used to keep bugs away in various cultures for thousands of years! Just spray on your dog before heading outside and you will see a drastic difference in the amount of bugs swarming. Extra bonus – since they are all natural, they work great on you too! UPDATE: Learn more about our experiences with natural pest control for pets here! A great idea for even the most sure of swimmers. Life jackets are particularly important if you frequent oceans, lakes, or streams with unpredictable waves or currents. 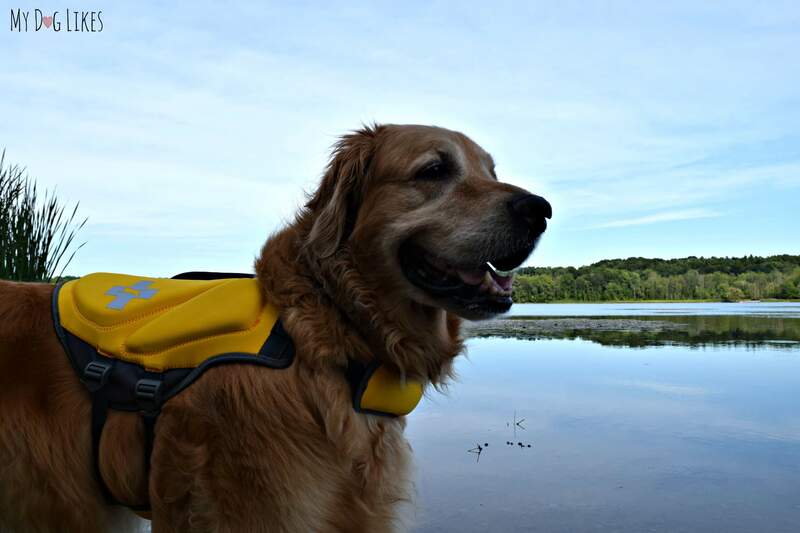 We purchased the Top Paw Life Jacket (above) for Harley last spring. Not only is it buoyant and reflective, but it has a large handle on the top for lifting in case of an emergency. We cannot put a price on the additional safety and peace of mind that we have since purchasing this for Harley. Dog vests can be useful for a variety of reasons. If you anticipate walking at night, picking up a dog vest with reflective trim is a must. In fact it’s not a bad idea for you to wear one as well! 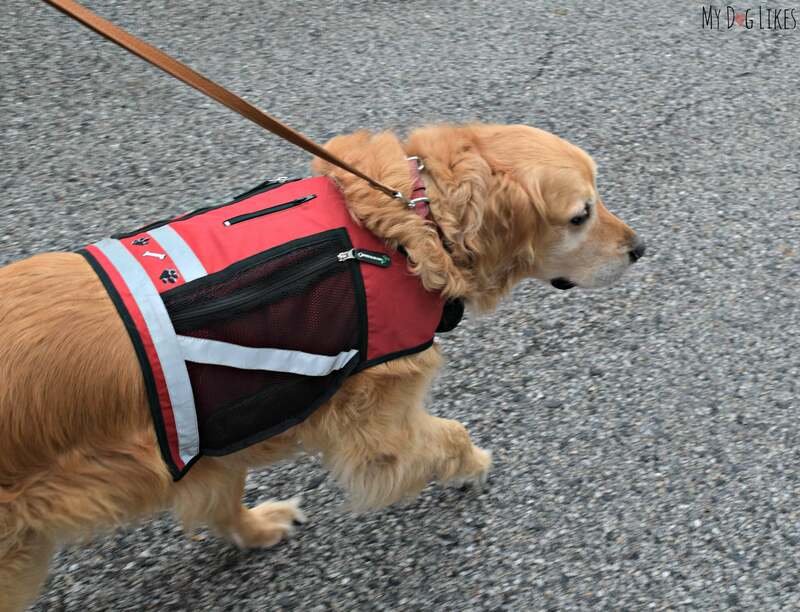 There are also many utility style dog vests on the market which include pockets for storage and supplies. 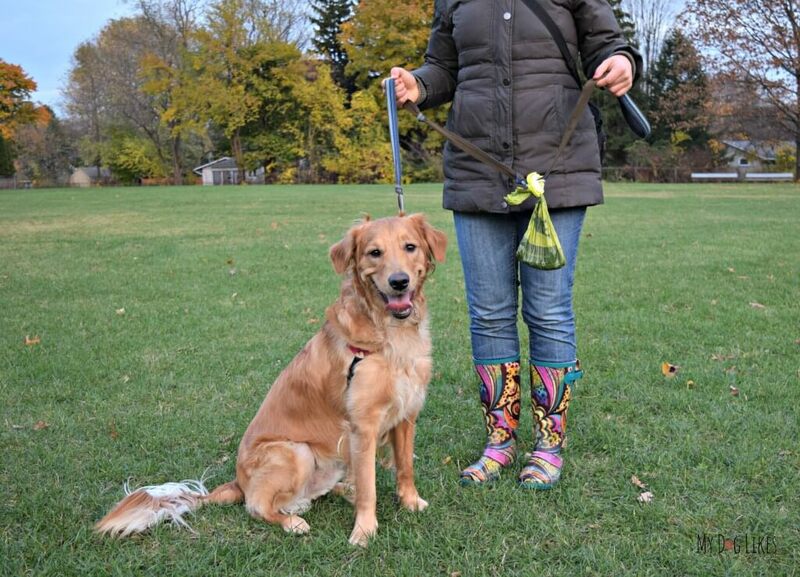 We love our PooBoss Dog Vest which has both of these features as well as a built in poop bag dispenser! Dental care is an often overlooked part of dog ownership. Unfortunately, plaque and tartar can lead to other health issues like damage to the kidneys, liver, heart and lungs. Regular brushing goes a long way to preventing periodontal disease and should become a regular part of your routine. 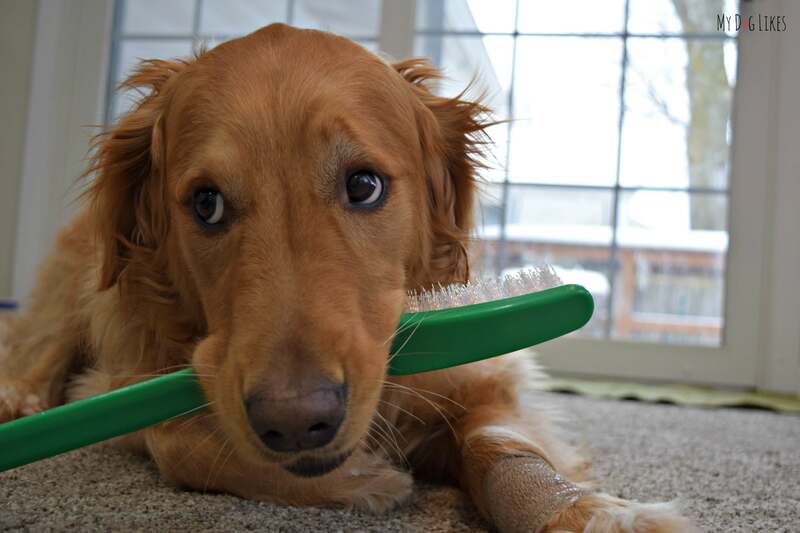 Getting your dog used to brushing their teeth is simple, start slow and give lots of treats! As with most grooming procedures it is a big help to get them used to it at a young age! Peanut Butter or Liver flavored toothpaste? That’s right, and dogs love it! We love Nylabone brand toothpaste and if you are just getting started, their oral health package typically includes a finger brush and regular brush too! An important thing to note is that dog toothpaste is edible (thank goodness) so you do not have to worry about rinsing your dogs mouth after brushing! Instead, focus your efforts on brushing the individual teeth and removing built on plaque. Dogs are not know for having the freshest breath. One of the biggest culprits is bacteria residing on the tongue. 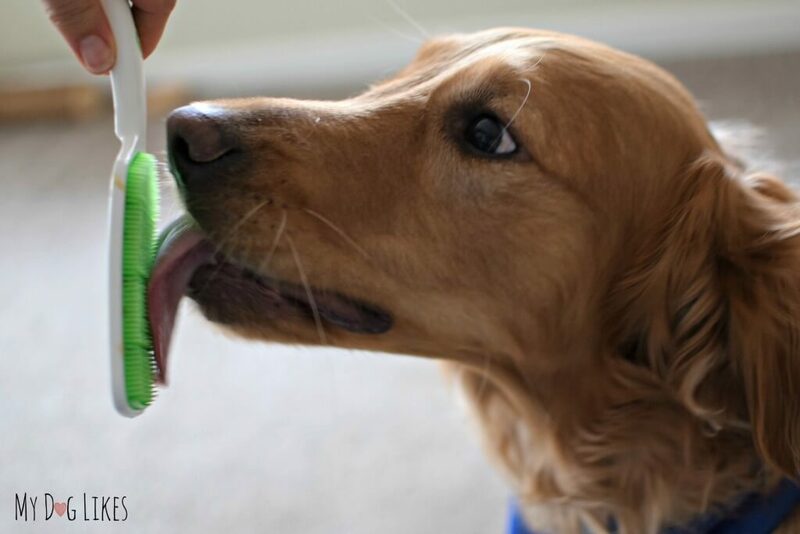 A dog tongue brush is an easy way to keep their mouth clean – and it is much easier to use than you may think! Apply a gel solution to the brush and allow them to lick. The hundreds of soft silicone bristles work to scrape odor causing bacteria from their tongue. Best part – you just hold the brush and they do all the work! Not sold on the idea of brushing your dog’s teeth? Dental Spray may be the perfect solution. 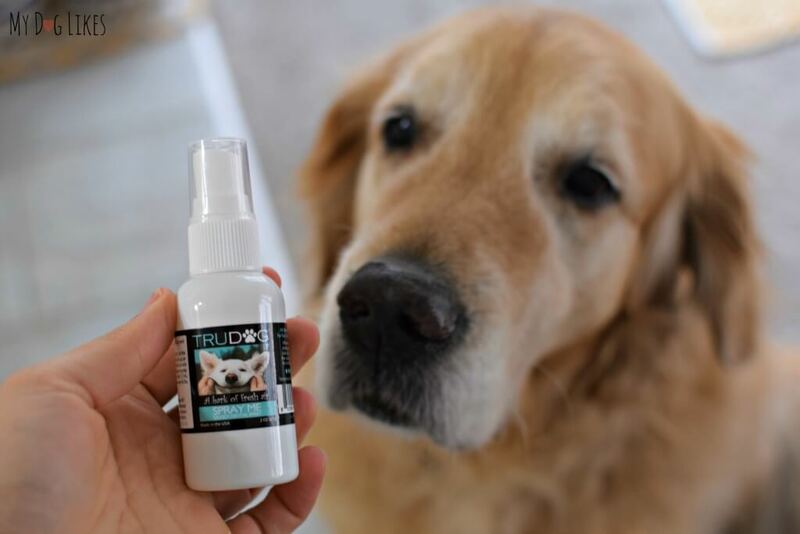 We love TruDog’s Dental Spray and it couldn’t be easier to use. Simply lift your dog’s jowls up to expose their teeth, then spray away. Enzymes in the spray sit on the teeth and provide many of the benefits of tooth paste. Just be sure to provide plenty of bones and dental chews to help work off any stubborn plaque or tartar! You will want to pick up a good pair of dog nail clippers to keep your dog’s nails trimmed. Excessively long nails can cause pain as they push into your dogs nail beds. They are also more likely to crack and bleed. Finally, long nails can lead to posture issues and unnecessary joint stress. In case you are not familiar, inside of a dogs nail runs a blood vessel known as the “quick.” It is important to familiarize yourself with its location before trimming so as not to accidentally nick it. As you can imagine this is quite painful and bleeds a lot! Here is a great guide to trimming your dogs nails. Whenever possible it also helps to get them used to nail trimming at a young age. 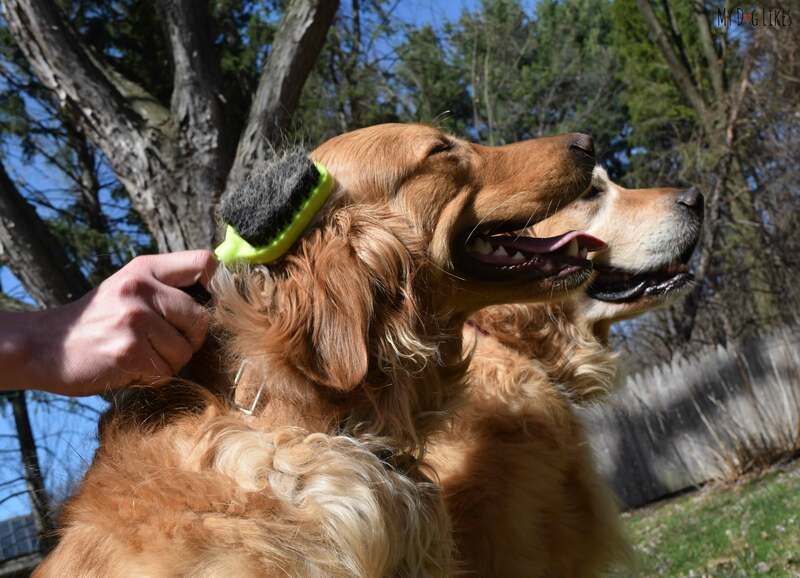 Regular brushing is key to keeping your dog’s coat looking and feeling great. This is especially important after a trip outside where they may have picked up burrs or gotten into a sticky substance like pine tar. Taking care to brush out these items from the coat will prevent the formation of painful mats that may otherwise require shaving to remove! Regular brushing not only keeps them tidy, but helps keep their coats soft by spreading their natural oils. One of our favorites is the FURminator Dual Brush which has a pin brush on one side, and a bristle brush on the other. It is news to no-one that dogs can get a bit stinky! Pet grooming wipes are an excellent way to neutralize odors and to also spruce up the look and sheen of their coat. They are particularly useful for small messes like muddy paws, or when you don’t have time for a bath. We love Isle of Dog’s “between bath” grooming products which include wipes as well as conditioning sprays. When selecting a dog shampoo it is important to keep in mind the type of skin and coat that your dog has. Also, do they have any allergies or special concerns like fleas or a skunk spray! There are countless options on the market that will apply to these various situations, but we always recommend choosing something natural that will be gentle on your dogs skin. You would be surprised at how sensitive it is under all that hair! 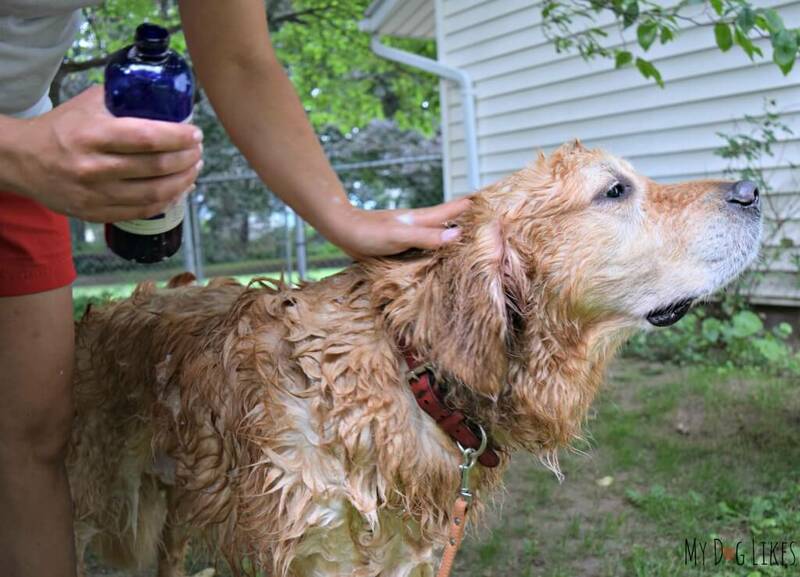 We have reviewed plenty of dog shampoos over the years and some of our favorites include 4-Legger, Organic Oscar and Dr. Harvey’s. If case you need more tips on giving a dog a bath, check out our step-by-step guide! Depending on the breed, a quality deshedding tool can be extremely important. These brushes work to remove loose parts of the undercoat during shedding season. 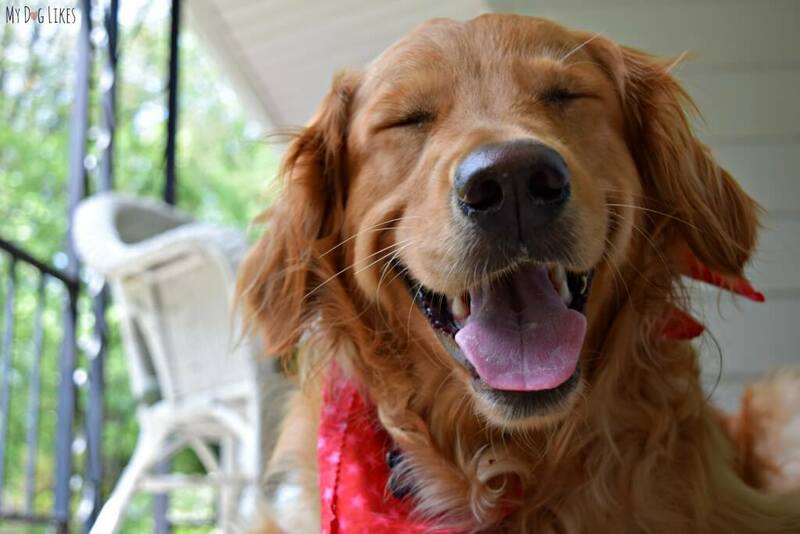 Our Golden Retrievers blow their coat once or twice a year and it is quite apparent by the tufts of hair protruding all over. These tufts are completely loose and can be picked right off – If you start to see this, believe me when I say there is much more hiding below! 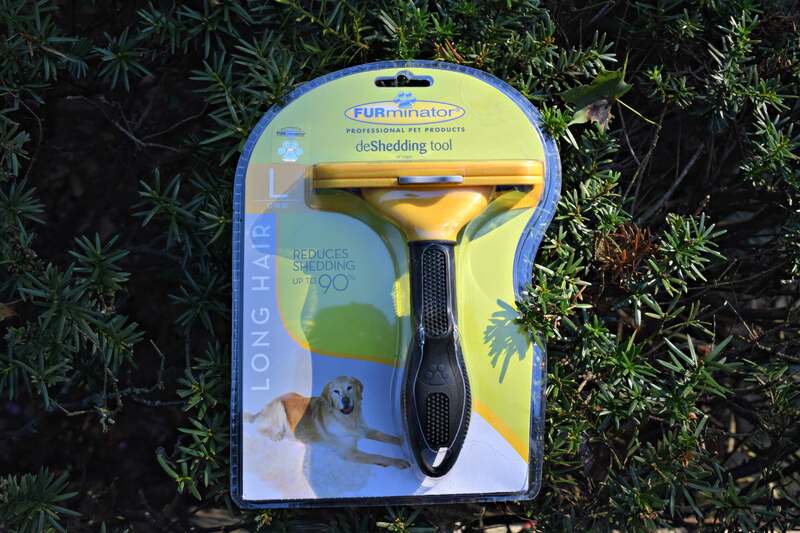 We highly recommend the FURminator deshedding tool to not only take care of the serious loss during shedding season, but is also great for regular upkeep. Deciding if you are going to be crate training is another important decision you will need to make. Many not familiar with dog training may see a crate as a form of punishment but in reality it should be just the opposite. 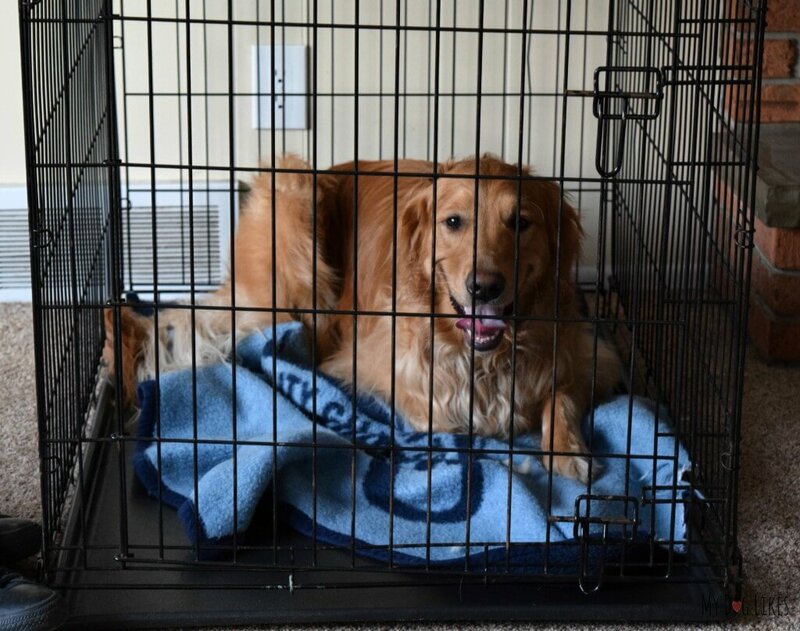 You want to teach your dog to view their crate as a safe space – a place where they can relax, cool down and rest without worry. Additionally, crates help to keep your dog safe by keeping them from chewing (and ingesting) things that may be harmful to them. Encourage positive feelings with treats and praise when your dog enters their crate. Also make sure to choose a crate that will be large enough for your dog to grow! The extra space can be partitioned off before your dog needs it! Chances are that you will need to block your dog out of a room at one point or another. This could be to keep them out of the kitchen while you are cooking or for their own safety during a home remodel. A baby gate is a convenient option to take care of this problem. There are even walk through options so you don’t have to hobble over it yourself! If this is your first dog, you may not be aware of how messy their water area can get. Dogs drink water in a very interesting way – using their tongue to toss it backwards into their mouth. As you can imagine, not all off the water will reach its intended target, especially if they are in a hurry. Furthermore if you are getting a dog with large jowls this will be even more of an issue. Jowls tend to hold and then release water as your dog leaves their drinking area. An absorbent placemat under your dogs bowls will help to keep your floor dry and are a breeze to wash! Salt and chemical ice melts can be extremely corrosive to your pups paws. Keep in mind that anything they walk on they are likely to ingest as well since dogs often lick their paws when they return home. 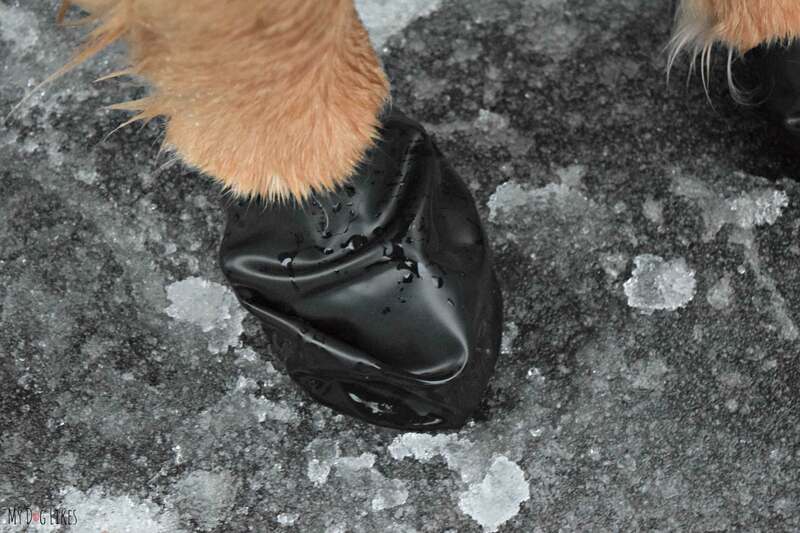 Always opt for pet safe ice melts to use on your sidewalk and driveway. If you are not using them already, you will also want to switch to all natural cleaners when bringing a dog into your home. Remember that they will be spending a significant amount of time lying on your floors and carpets. They are also quite likely to be licking these surfaces as well! We love PL360’s product line which includes all natural surface cleaners, deodorizers, carpet powders, stain removers and more. Just like the comfort that a a soft stuffy brought to you as a child, your dog loves to bite, squeeze, and snuggle with soft toys. Not all soft toys are created equally and it is important to consider your dog’s individual habits before making a purchase. If your dog is still in the “kill all things” phase of development, extra durable stuffies like Tuffy Toys are a great option to stand up to some rough play. 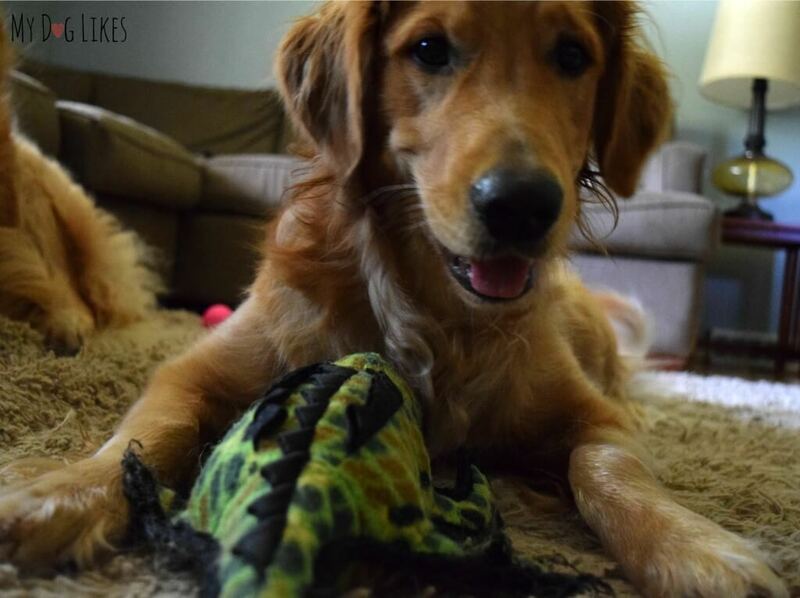 If your dog loves to rip out the stuffing from toys, try a stuffing free toy like the Ethical Pet Skineez! A helpful tip: Not all dogs can handle having stuffed toys. A helpful tip for us has been to remove the toy and put it away whenever play time gets too rough and the toy is being chewed or torn. 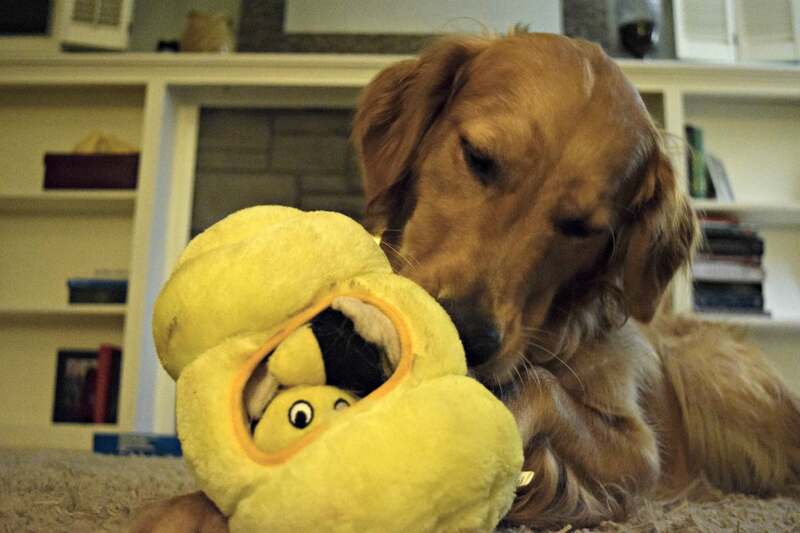 After taking it away, provide your dog with a toy that is appropriate for chewing. Keep doing this until your dog outgrows the behavior! Tug toys are a great way of playing with your dog. Dogs innately love to tug and if you don’t provide them with the right tools for doing so they will make their own (often with disastrous results!). Our favorite tug toy is the Puller Training Device. Not only are these rings SUPER durable, but there are two of them in a set which really helps to reinforce the drop it command! Need some other ideas? 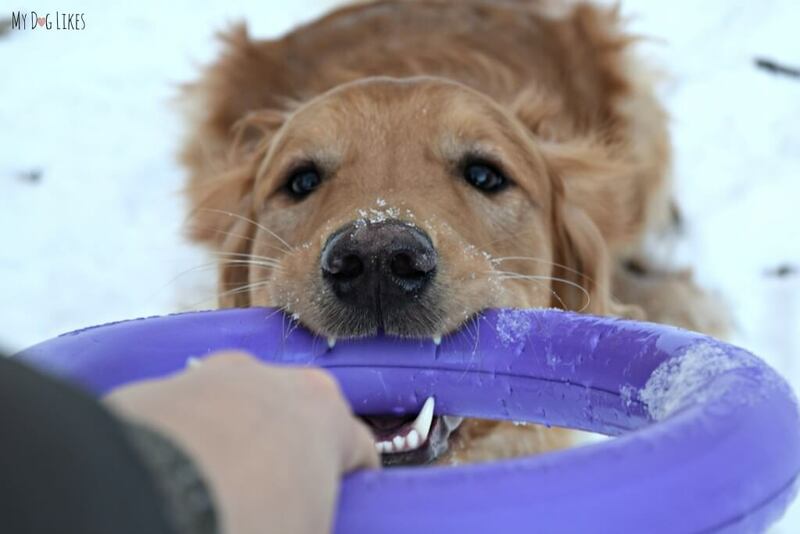 We love the Kong Squeezz Ring & Rope too. This toy is a two-fer providing fun fetching and dog-human tugging! Chewing is an innate desire of dogs and it serves several purposes. For one it provides relief for teething puppies. It also serves as an outlet for built up energy. Finally, it works to remove plaque and tarter from your dogs teeth and gums. NOTE: Chewing should always be a supervised activity. 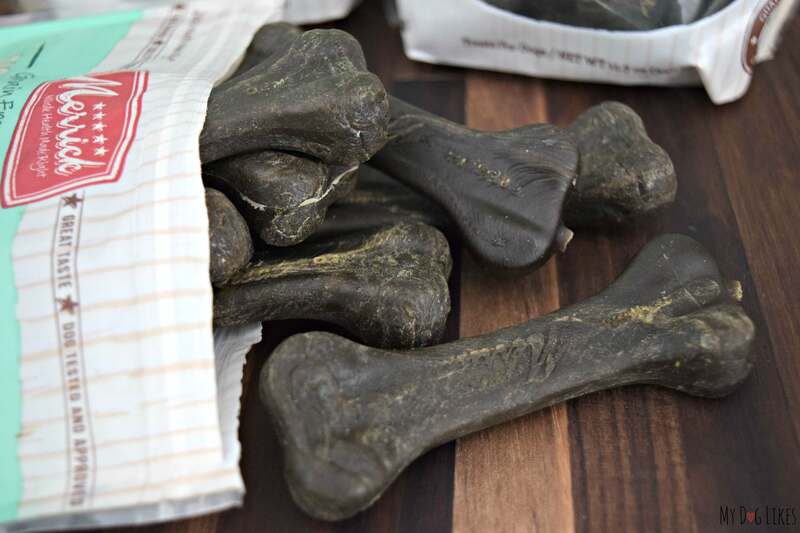 Despite how tough a chew is advertised to be, there is always a chance that your dog will be able to break off a large chunk that could become lodged in their throat. Even if these pieces are swallowed you are not out of the woods yet as they could still cause a blockage or intestinal bleeding! We are big fans of Nylabone who makes both edible and non-edible chews. The Nylabone Dinosaur Chew (shown above) is a non-edible chew that works to clean teeth as small bits of plastic become raised during chewing. Recently, we became aware of a “new bone in the yard”, Benebone, which we are really loving for the boys. Though a nylon chew, there are no artificial flavors in this bone! Most dogs love to chase and fetch. Some dogs, like our Charlie are OBSESSED! A good selection of balls and frisbees can really liven up your daily walk and time at the park and help to burn some extra energy. The standard tennis ball is a perennial favorite, but add a squeaker like the Kong Squeakair and you have a real winner! 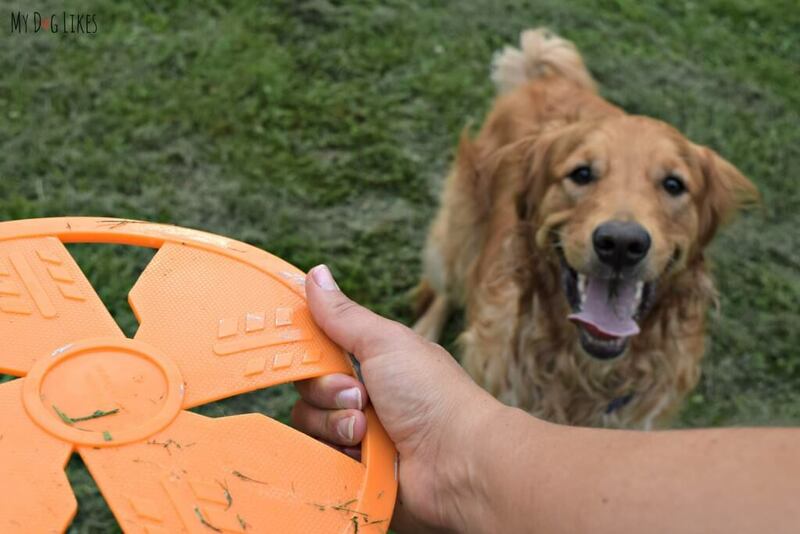 If your dog love’s tennis balls, try using a ball launcher to really go the distance with long throws! Tennis balls not only are great for fetching but they provide the perfect amount of resistance for in between fetch chews! There are also a huge variety of dog frisbee’s on the market including those designed to fly high and unpredictably, straight and catchable or fast and far! 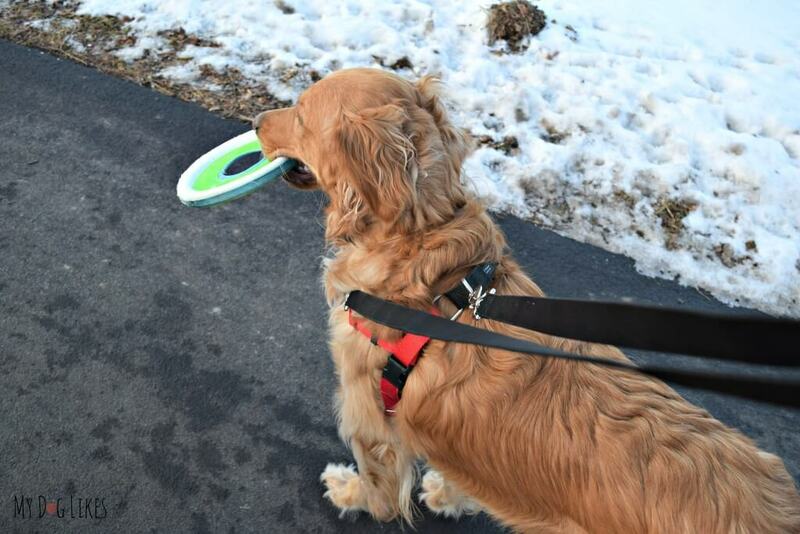 UPDATE: Read more about our favorite dog frisbees and our favorite outdoor toys for dogs! 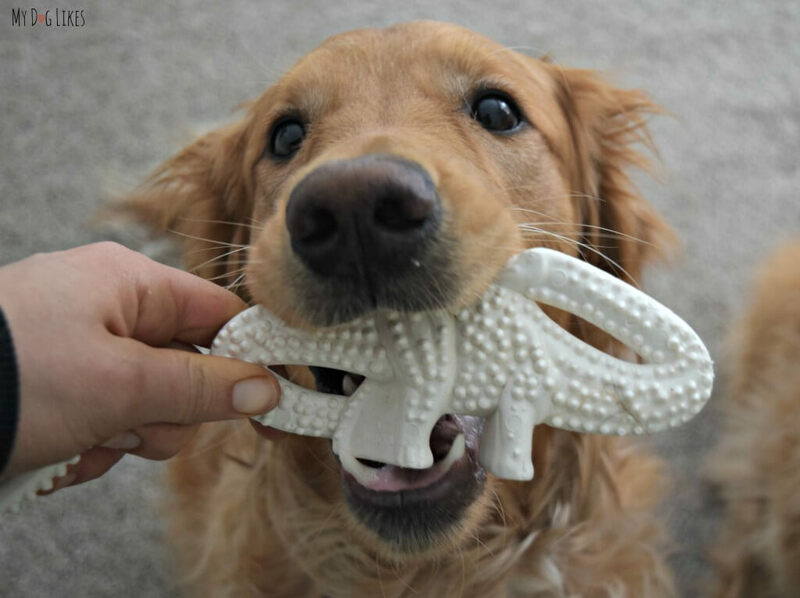 Dogs require mental stimulation just as much as physical exercise, and interactive toys are a great way to challenge a bored pup. Puzzle toys are very popular and one of our absolute favorites is the Kyjen Hide-a-Bee (pictured above). This plush toy comes with a hive and several small bees to stuff inside. Playing off of your dogs instinctive desire to hunt, they will work diligently to get all the bees out! Best of all – you can load them right back up again for more fun! Kyjen makes several other styles as well including Hide-a-Squirrel and the Platypus Egg Babies. Another category of interactive toys are treat dispensing toys! These toys require your dog to manipulate them in a very particular way in order for treats to fall out. As you can imagine the scent and occasional reward will keep a dog interested and entertained for quite a while! One of the most popular varieties is the Bob-A-Lot by StarMark. Dental chews are an excellent (and convenient) way to help keep your dog’s teeth clean. These dense, but edible pressed treats work to break up tartar while being eaten. We have reviewed many dental chews over the years, and our favorites include Merrick, Blue Buffalo and OzPure. One thing you will want to keep in mind with these chews is that they are large and can contain a fair amount of calories. 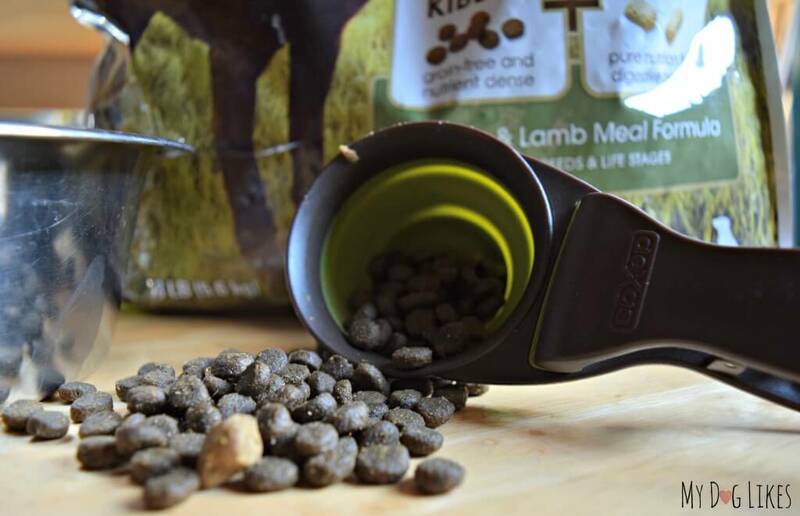 For this reason you may want to adjust your pups portion of food on a day they receive these special treats! The earlier you start training the better. If you have a puppy in the home, those cute naughty behaviors will become a serious problem in no time! As a pet parent “in training” you’ll want to reinforce good behavior without packing on the pounds. For this reason, a good training treat is needed. Finding a training treat that is high value, low calorie, and soft enough to be chewed on the go is the sweet spot. 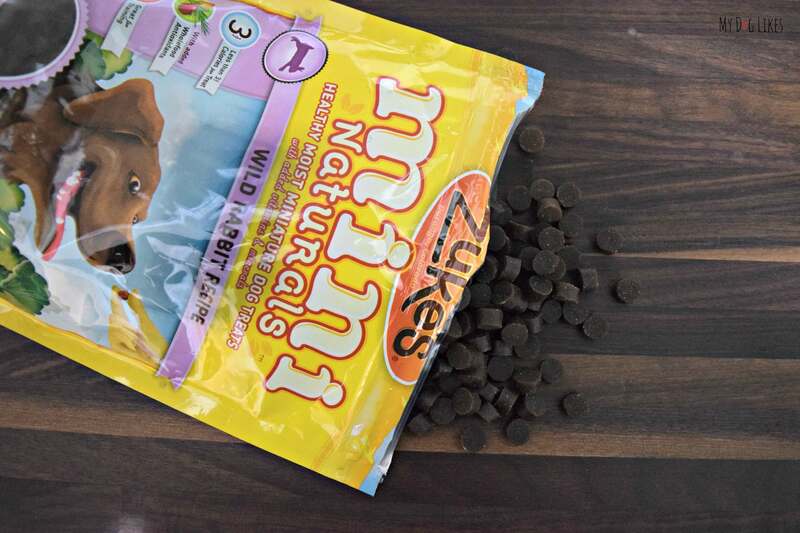 Here is a quick rundown of some of our favorite dog training treats. Vaccines are considered to be one the easiest ways to keep your dog healthy. They work by introducing antigens that resemble common diseases into the immune system so that it can prepare to fight them off when/if exposed. While your vet may have different recommendations, the standard vaccinations include protection from deadly diseases like rabies, parvovirus, and distemper. Caring for a dog can be costly. Thankfully, there are many free or low-cost options for pet parents to provide their dogs with the protection that they need. These clinics are often hosted by pet food/supply stores or by your own town/city. Heartworm is a preventable disease spread my mosquitoes who bite afflicted animals. Without protection from the parasite, the heart, lungs and associated blood vessels of animals can become infested with worms that eventually prevent the flow of blood. Left untreated, Heartworm is deadly for dogs. Luckily, preventatives are available from your veterinarian and are effective at killing the parasite if your dog should be exposed. While many veterinarians will suggest that your dog be treated year round, dogs who reside in cold climates (freeze), where mosquitoes are dormant for part of the year, can sometimes take a couple of months off. Whether you choose an all natural approach like preventative all-natural sprays or decide to go the route of chemical preventatives, your dog needs protection from fleas and ticks. Ticks can spread disease like lymes and fleas are not just a nuisance, but can cause serious skin problems for your dog. The best way to avoid these problems is to use a preventative. Make the choice that is right for your dog based on their health, environment, and activity level. Choices includes collars, natural sprays, natural topicals, and chemical topicals. Being proactive in your dog’s joint health can help to prevent more serious problems like arthritis down the road. Glucosamine and Chondroitin Supplements have been shown to improve joint health by decreasing inflammation and aiding the body in strengthening and repairing tissue. These supplements take a variety of different forms including chewable tablets and soft chews. Cleaning your dog’s ears is one of the simplest ways to keep your dog healthy and it is easier than you might think. It is important to find a dog cleaner that gets the job done but is also gentle and non-irritating to their sensitive ears. 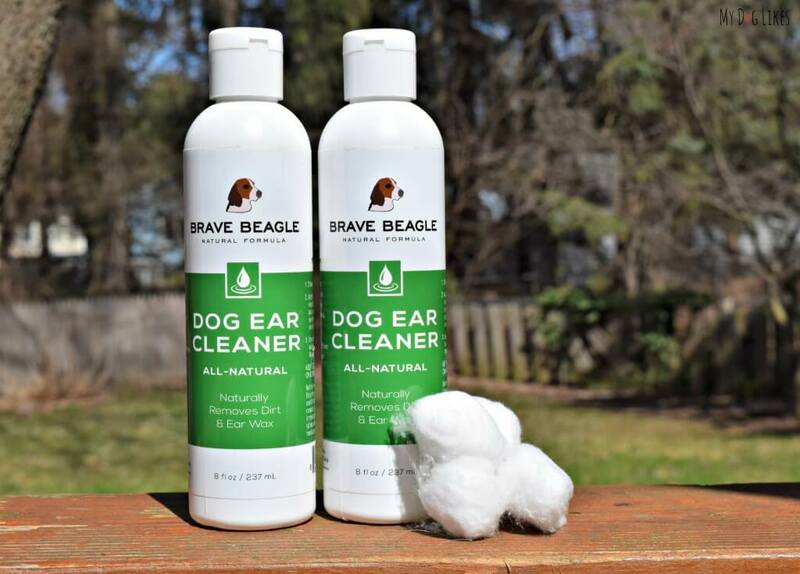 While there are many different options out there, we LOVE Brave Beagle Ear Cleaner. This cleaner is all-natural, non-irritating, and doesn’t leave their ears oily after use. Getting in the habit of cleaning your dog’s ears regularly will help avoid nasty, painful, and irritating infections. Interested in trying out Brave Beagle? Check out our special savings! All dog owners should keep a bottle of hydrogen peroxide on hand. Not only does it help to clean wounds, but in case your dog ingests something poisonous, hydrogen peroxide can be used to induce vomiting. In case you are not aware here is a great list of common household items toxic to pets. Gauze and cotton balls are great for accidental injuries that bleed but are also wonderful for gently cleaning the eyes and ears. Additionally, gauze can be used for introducing tooth brushing for dogs who are a little freaked out by tooth brushes. Self Adhesive Bandage Wrap can really come in handy after a paw or dew claw injury. Dogs typically will not leave a cut alone in order to let it heal. Instead they are drawn to lick and gnaw at the painful area which can lead to further bleeding, slow healing, or infection. Wrapping the area wounds the time to heal and can be a way to avoid the dreaded cone! As careful as we are, at one point or another, if you have a dog, his/her quick will be exposed and create a bloody mess! Many pet parents have nicked the quick while cutting nails, but it can also happen when playing or running through tall grasses. Though a very manageable problem, the wound will bleed profusely and cause panic. Styptic powder works by helping the blood to clot in order to stop the bleeding quickly. No styptic powder on hand? Corn starch can work in a pinch! Unfortunately at one time or another you will likely need to purchase a cone to keep your dog away from a wound. Fortunately, there are a lot of options on the market that are great for different areas of injury. While the standard cone can cause problems with depth perception and mobility as they bang into doors and walls, there are many manufacturers that have overcome these problems by providing see-through, flexible, or inflatable options. Find the option that works best for your dog and is adjustable as they grow. Allergies and skin irritations are an all too common problem for our dogs. An all natural healing cream like Dr. Harvey’s works wonders by clearing up rashes and other skin issues. Because it’s all natural this product is also gentle on irritated skin and can be applied regularly. While it is not designed to be eaten, this natural product will not make your dog ill if they lick the cream. You know how your hands get dry and crack in the cold winter months? Well, the same thing can happen to your dog’s paws! Using a moisturizing balm will help keep them from drying out and cracking under harsh conditions. We have recently begun using Walter’s Dog Balm and absolutely love the way that it gently and naturally moisturizes and protects their soft parts! 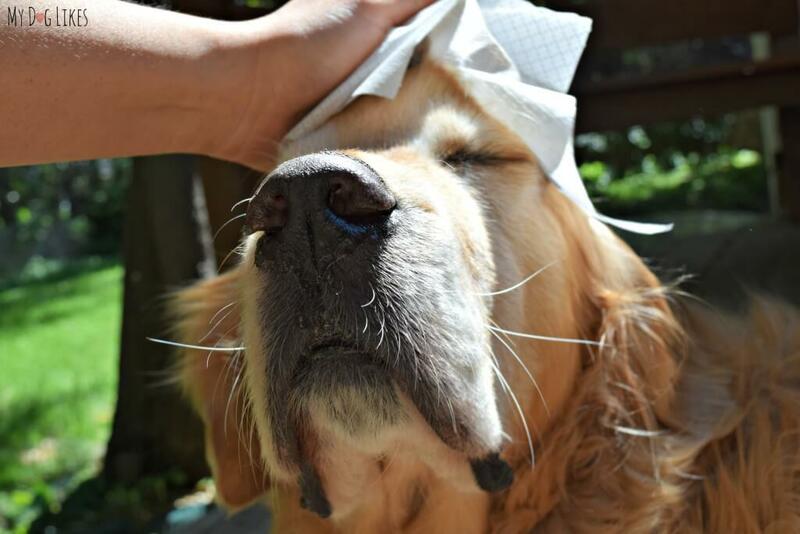 While some dogs require regular antihistamine usage in order to keep their season allergies at bay, keeping a dog safe antihistamine in your first aide kit is a must. Among other things, your dog can unexpectedly be stung by a bee or roll in/ consume something that causes an allergic reaction. When your dog starts to swell up, you’ll want to be prepared! A common recommendation is Benadryl and keeping a few tablets in your kit, will insure that you are prepared for these scary moments! Do you have hardwood floors in your home? Dr. Buzby’s toe grips are small rubber bands that fit over your dog’s nails and allow them to get more traction on slippery floors. Best of all, since they sit only on the nails, after a few minutes, the majority of dogs will not even notice they are on. Bringing a dog into your home is one of the most rewarding things that you can do. Remember that proactive healthcare can prevent more serious health concerns down the line and being prepared for the what-if’s in life will help you to feel confident in those unexpected moments! Even with a list of dog supplies and lots of knowledge, there will continue to be those times where you feel overwhelmed or like things are going terribly. In these moments, take a deep breath and know that “this too shall pass”. These tough puppy moments and sleepless nights will all too soon be a distant memory. Practicing patience and consistency in all that you do will pay off! Have other ideas or dog essentials that you just couldn’t live without? Wow, this is really a great list, and a good reminder that having everything your dog will need is a true investment in your lifetime relationship with him or her. Thanks for this; definitely sharing on our FB page! Thanks Christina! There is a lot that goes into dog ownership and even though you don’t need it all right away – you may at some point in the future. Great list. I wish I had this when I adopted my boy Riedi over 13 years ago. I didn’t know what I was doing and fumbled along. I have a lot of these products, but there are several new ones for me, so I am going to go check them out! This is such a great list! Many people will not think about many of these products as a necessity but once they see the reason to have them, it will be something they can’t live without. I love the idea of the long lead. It is a great, safe way to practice recall. Holy cow! That is seriously a list. We have a few must haves, but Mom is more a fly by the wire person when it comes to what she likes to have around at any give time. Great bunch of items you have I must say! This list is ah-mazing! I’ve been wanting to come up with a pyr “resource guide”, but this knocks the socks off of anything I could have imagined! Thanks, Kelsie! It was a lot of work but we wanted to put together something as comprehensive as possible! Fantastic list! Food puzzles and a clicker are huge ones for me! This is an amazing list of resources! Thermometer is good to have on hand. A phone number for poison control. Also activated charcoal ipecac syrup. Children’s Benadryl. Bandaids A scale your vet may need a weight to tell you how much medicine to give your dog or wormer. Excellent suggestions! I will be updating the post soon! That’s a great list! I might add a dedicated dog blanket. Mine each have a blanket of their own. They sleep with them in their kennels. My little papillon has anxiety, so whenever we have to travel, I put her blanket with her, and she is much calmer because it’s familiar. And it’s nice for both of the dogs to have a warm blanket on a cool night. I also recommend an orthopedic crate pad, but I know that isn’t a necessity. Still, this is a really great list! Lots of good ones here! I love the Fur-Izzy, which is a new(ish) discovery for me. It’s made locally (to me) and it’s genius. It’s a grooming tool, and the dogs absolutely love it. I also love the boomerang identification tags – they slide onto the collar, which I love! Another favorite is the quiet spot. It’s a tag silencer that is a little pouch that contains the tags and keeps them from rattling around – plus it has reflective stuff on it too, which I think is a cool bonus! A Bob-A-Lot Interactive treat toy! I went to a lecture on winter play for dogs and this toy was recommended. I’ve bought her so many toys, in the past, that she never plays with and I figured it would be the same with this one. I decided to take a chance, fully expecting it to be another dust collector. She loved it immediately! It has just the right amount of balance and bob that it doesn’t immediately roll under the couch. This keeps my dog busy for a good 20 minutes while I’m fixing dinner. She goes crazy when she sees me pull it out each evening. When she’s happy, I’m happy.